Funcom's hard at work on Age of Conan and Secret World, and is cooperating with the economic crime unit. 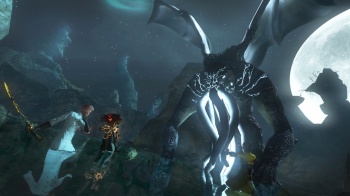 When Ã˜kokrim - the Norwegian National Authority for Investigation and Prosecution of Economic and Environmental Crime - raided Funcom's offices, the natural assumption would have been that all was up with The Secret World developer. Not so, says Funcom. Its communications head Erling Ellingsen has leapt into the breach, saying that Funcom is cooperating fully with Ã˜kokrim, and work continues on its titles. "Production on all Funcom games continues as normal, and the company remains fully committed to games in development as well as the continued operation and updating of existing live games," says Ellingsen. "Yesterday's events are not expected to have any impact on the company's continued operation or the development on future releases." The raid is connected to the release of The Secret World, and there's suspicion of infringement of the provisions of the Securities Trading Act with regards to financial information given to the market when the game launched. Just before launch, Funcom's former CEO Trond Aas stepped down, taking himself off the company's primary insider list. Once off the list, he could sell stock, and he dumped 650,000 shares as quickly as he could, in a bid to get rid of 1.5 million shares. The sell-off was discovered, Funcom's share price went through the floor - dropping from $17.70 to $1.68 in three months - and The Secret World launched. It did not do well. It tried to go subscription, and people hated it. It switched to buy to play, and numbers went up. The Secret World is still going, Ellingsen reminds us. "In terms of The Secret World, developers are currently in the process of finalizing its ninth content update, which will send players on a grand adventure through Tokyo, and Funcom will be releasing new information and screenshots from this update soon."